I can't confirm the source or the veracity of the photo below, but I willing to bet it is real. Haven't we all wondered about those triangular cheese slices at Subway? 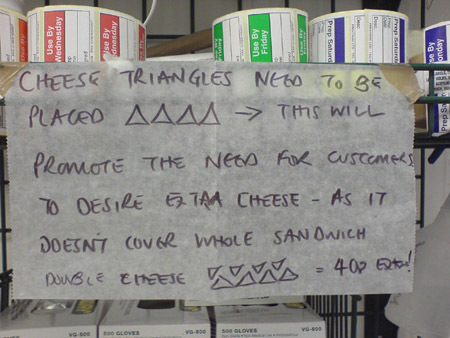 The sign reads: "Cheese triangles need to be placed (image)... this will promote the need for customers to desire extra cheese, as it doesn't cover whole sandwich. Then it shows how to place 'double cheese' and has the price for double cheese. It really isn't a bad plan. I've often thought that my Subway sandwich would be better with better cheese coverage, but I'm not one to pay extra for double cheese. And it can't be called a scam; it isn't like Subway has suddenly reduced the amount of cheese they put on a sandwich. By the way, we're certainly not the first to ponder the logic of the triangular cheese slices at subway... here's a cartoon about it at left-handed toons. Funny stuff! Previously we've also written about a "No free refills" sign at a Subway in New Jersey. Back in March, Dunkin' Donuts announced its first-ever "Creat Dunkin's Next Donut" online contest, with a $12,000 grand prize. Of the nearly 13,000 submissions they received, Dunkin' has selected 12 finalists from which you can pick your favorite and vote for it. The 12 finalists will be traveling to Dunkin' Donuts University in Braintree, MA on May 28th for a bake-off before Dunkin's Donuts' culinary team and company leaders, along with Paul Mullins, author of Glazed America: A History of the Doughnut, and Diane Werner, food director for Taste of Home, the #1 cooking magazine in the country. The winner will be chosen based on the voting results and the bake-off. Chipotle is expanding its local produce program this summer. They will now purchase at least 35 percent of at least one bulk produce item in all of its restaurants from local farmers when it is seasonally available. This is a 10% increase over last year and a first among fast food chains. Under the program, Chipotle expects to have more than 25 local farms in its network. They will supply some of the lettuce, green bell peppers, jalapeno peppers, red onions and/or oregano served in Chipotle restaurants. 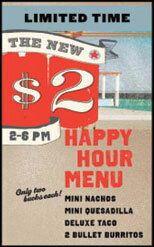 Taco Del Mar has introduced a Happy Hour Menu of 4 items available for $2 between 2 and 6 PM daily. Mini Nachos - tortilla chips topped with beans, queso, pico and a choice of salsa. Mini Quesadilla - filled with cheese and pico. Deluxe Taco - soft or hard-shelled taco with chicken or beef, leuuce, pico and chipotle sour cream. Two Bullet Burritos - an order of 2, snack-sized Mondo burritos with chicken or ground beef. 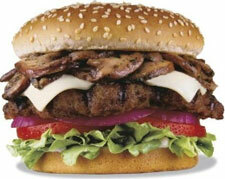 Carl's Jr. is bringing their Portobello Mushroom Six Dollar Burger back to fast food. It was originally introduced in 2005 and then again in 2007; it will now be a permanent menu item. It features almost 1/2 pound of Angus beef, topped with Porobello mushrooms sauteed in a garlic-butter sauce, Swiss cheese, red onion, lettuce, tomato, and mayonnaise on a seeded bun. It costs $4.89 or $7.39 for the combo. There is a $1 off coupon available that is valid through 6/30/09. Matty Boy Anderson created the humorous and disgusting illustration: "Anatomy of a Chicken McNugget." It is posted on his Mike the Pod website, which he describes as "The Most Awesome Site Your Human Eyes May Ever Behold: 10 Years of Ill Humor." Anderson says, "People tell me that this is hands-down the sickest thing I've ever done. So take that as a warning if you need to. The ironic secret: I still occasionally eat them. Haw!" Anderson's illustrations and descriptions of what a McNugget really is, appear on the Mike the Pod website, here. There are 3 'varieties' in his illustration, I've included one of them below with his introduction. Enjoy! For many years, it was believed that the "McNugget" served at McDonalds restaurants was a batter-fried piece of formal chicken. Now, Mike the Pod has learned the ugly truth. In its search for a less-expensive more plentiful food source, McDonalds has employed genetic engineers to create the macnugeta repulsiva, a diminutive creature that lives in tanks of protein-enriched slime lit only by black light, until its brood grows large enough for it to be thrown live into frying batter (usually when their offspring reaches the healthy number of six, nine or twenty). Herewith, our disturbing findings. 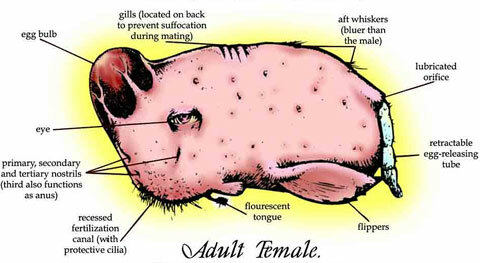 Adult Female: The female has a thicker coating of secreted mucous and is therefore more difficult to catch. She uses her flourescent tongue to make chirping noises, much like a dolphin, to attrack the male. Last year an Italian named Claudio Torghele announced his "Let's Pizza" vending machine that makes pizza from scratch in less than 3 minutes. That's some pretty fast food. The machines have been deployed in Europe and each pie runs about $6. Claudio device allows you to watch the entire process through glass: mixing and kneading the dough (yes, it starts with dry flour), spinning the dough into a flat disc, adding the sauce and selected toppings (4 pizza choices), and finally the cooking. More recently a US company announced their "La Pizza Presto" pizza vending machine. This version slides a pre-prepared pizza out of box and under a heating lamp, then slides it back into the box and presents it to the vendee. American Airlines will be offering Boston Market sandwiches and salads for sale on some of their flights. Fast Food has long been available in the airport, but now you can buy it in-flight, too. "We are pleased to partner with Boston Market to provide our customers with quality inflight food options from a reputable brand name that they recognize," says John Tiliacos, American's managing director, onboard products. Boston Market Chicken Carver: All-white meat chicken, cheddar cheese, leaf lettuce, sliced tomato and Dijon-mayonnaise served on an artisan roll with Miss Vickie's chips. Boston Market Beef Brisket Grinder: Tender beef brisket, provolone cheese, mesclun greens, mild giardiniera relish, and Tuscan-mayonnaise served on an artisan roll with Miss Vickie's chips. Boston Market Italian Grinder: Salami, smoked ham, provolone cheese, mesclun greens, sliced tomato, and olive-parmesan spread on an artisan roll and served with Boston Market's light balsamic vinaigrette on the side and Miss Vickie's chips. On July 1, the sandwiches will be offered on additional routes. In a big victory for Dr. Pepper (and Dr. Pepper drinkers like myself), McDonald's has reached an agreement with the Dallas-based Dr. Pepper Snapple Group to make Dr. Pepper available at all of McDonald's 14,000 US locations. DP is currently available at about 8,500 McDonald's. In a slight blow to #1 soft drink company Coca-Cola, Dr. Pepper will replace Coke's Pibb Xtra. McDonald's is expanding its fountain and bottled drinks to complement McCafe espresso-based drinks available in about 70 percent of its U.S. stores. McDonald's operators will have a choice to add Diet Dr Pepper, now featured at 3,500 stores, as Dr Pepper Snapple tries to increase its third-place share of the Coke-dominated U.S. fountain drink market. Dr. Pepper now has 100 percent availability at 25 of the top 20 30 fast food chains. 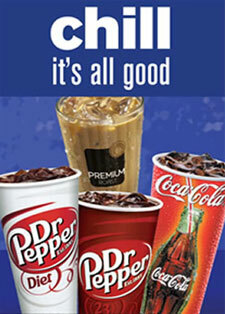 Dr. Pepper has even set up a website to help McDonald's franchise operators market their new beverage offering. While KFC is falling all over itself to try and save face after offering a coupon and then refusing to honor it (offering a rain check instead), El Pollo Loco is taking KFC to task and looking like a much more professional and on-the-ball organization than KFC. They also criticize KFC for copying their free grilled chicken promotion. But now that KFC has gone back on their free meal coupon offer, El Pollo Loco really has something to highlight, a huge failure on their competitors part. I'm sure we'll be seeing a new video from El Pollo Loco about this in mere hours. A fast food chicken battle is clearly underway! KFC has officially canceled, voided and revoked the coupons they originally issued on their web site (and talked about on the Oprah show). As we wrote about yesterday, some KFC fast food restaurants had been declining to redeem the free grilled chicken meal coupons promoted by Oprah on her show Tuesday. They are now issuing 'rain checks' to those who jump through a few hoops. If you downloaded the coupon, you can print it out and take it to your local KFC, they, in turn, will give you a form that you'll have to fill out and mail to KFC. KFC says that they will then send you another coupon for a free grilled chicken meal (and a free Pepsi) that can be redeemed during certain dates listed on the coupon. Their goal here, of course, is to try and spread out the dates during which people will be coming in to the restaurants for free meals. I'm sorry, but a company as large as YUM! Brands (KFC's parent company) should be grown up enough to know what kinds of promotions their restaurants can handle and have the marketing smarts to be able to predict the kind of response they're going to get. This is a shameful business failure on the part of KFC/YUM! Brands. Oprah has changed the message on her KFC Coupon page to reflect the new 'rain check' policy. I'm surprised this hasn't shown up somewhere before. It is the perfect blending of American and Mexican cuisine... and so simple. A hamburger patty in a taco. Rubio's describes their creation thusly, "a juicy, perfectly seasoned, char-grilled beef patty topped with melted American cheese, then complemented with salsa fresca, smoky garlic-chipotle mayo and lettuce. Served in a warm, soft flour tortilla with a jalapeno alongside." It is a hamburger in a taco. Rubio's calls it the "burger with a Beach Mex twist." I call it genius! I wish I was nearby, I'd love to try one. If you have, let us know about it. This could be a fast food breakthrough. The $2.99 All-American Taco will be added to Rubio's menu for a limited time beginning today. "I've always wanted to blend the cultural tastes of Mexico with those of the U.S.A., and I think this new All-American Taco is better than either on its own," says Ralph Rubio, co-founder and chairman, Rubio's. "We looked beyond the expected to introduce something totally unique, and with one bite the All-American Taco brings fond memories of the local beach drive-in and a trip to Cabo all at once." 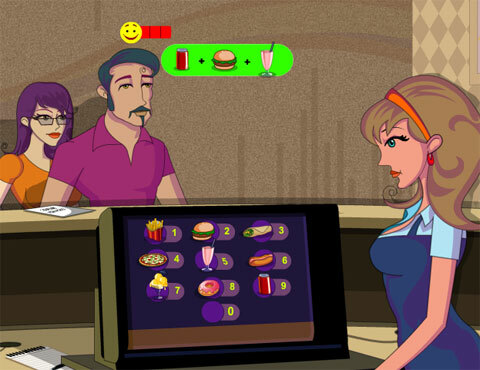 Practice your fast food worker skills with this new flash game called "Fast Food Delivery." Your task is to take the orders of all the folks who come up to your fast food counter. You know what they want, because you can 'see' what they want in their "thought cloud" and then you enter the numbers on your cash register screen associated with the items they want. You're playing against the clock and with each level the number of items your customers are ordering increases. I guess McDonald's finds this video reassuring. It might be to some... especially those with a taste for mechanically processed meat 'product'. To some the video might show a little more than people want to know. There is certainly nothing unusual here... most of our food today comes from processing factories like these, but it is interesting that McDonald's wants to show it off. I first saw the video after reading about it at Gizmodo. They were horrified and disgusted. They were shocked that McDonald's needs to put their meat patties through a metal detector for safety. I guess they'd be surprised to learn that that happens at most food processing facilities and it is just simply a good idea to ensure safety. 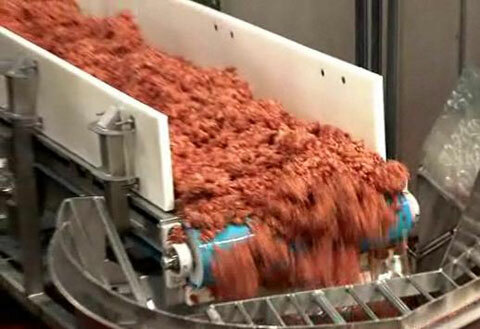 McDonald's has titled the video, on their web site, "At Lopez Foods, only 100% beef makes the grade." I guess the title bothered me a little before I even watched the video: I was hoping that "100% beef" was the expected standard, not something that has to be promoted. They mention that the beef is "100% beef" in the video, too. But most of the folks interviewed in the video refer to the meat as "product." So, they're processing the "product" they receive into hamburger patties. Okay. Maybe you should call it meat in the video. All in all, it is standard McDonald's health and safety propaganda, I'm just a little surprised that they would chose to make some of these video images public. Some people certainly will find it gross. 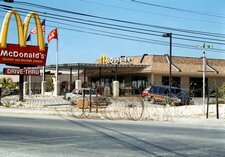 In 1986, Guantanamo became host to Cuba's first and only McDonald's restaurant, as well as a Subway. These fast food restaurants are on base, and not accessible to Cubans. It has been reported that prisoners cooperating with interrogations have been rewarded with Happy Meals from the McDonald's located on the mainside of the base. In 2004, Guantanamo opened a combined KFC & A&W restaurants at the bowling alley and a Pizza Hut Express at the Windjammer Restaurant. There is also a Taco Bell, and an ice cream shop that sells Starbucks coffee. All the restaurants on the installation are franchises owned and operated by the Department of the Navy. All proceeds from these restaurants are used to support morale, welfare and recreation (MWR) activities for service personnel and their families. 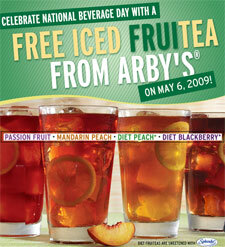 This Wednesday, May 6, 2009, Arby's will be celebrating National Beverage Day by offering free Iced FruiTeas. Just go to Arby's and say "I'm parched. FruiTea Me!" and try a free FruiTea in one of 4 flavors: Passion Fruit, Mandarin Peach, Diet Peach or Diet Blackberry. 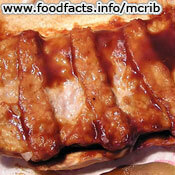 Okay, fast food fans, it has arrived, The McRib Locator. As we all know, it isn't available at all McDonald's, all the time, just some of the McDonald's, some of the time. Created by a meterologist in Burnsville, MN, The McRib Locator allows you to enter the location of a McDonald's you've spotted that is selling McRibs. The sighting will be represented on a Google Map that everyone can check. If you find someplace near you on the map that's serving McRibs, but you're on the fence about whether or not you want one... let Fast Food News help you with your decision... we've Deconstructed the McRib for your viewing pleasure. Check it out, then make your decision. Burgerville is launching a pilot program at its Salmon Creek, Washington restaurant today. Starting at 11 a.m. this morning, the chain will begin selling local beers and wines. Interestingly (and smart! ), Burgerville is making a two-drink limit for their guests (21 and up only, of course). CEO Jeff Harvey is taking Burgerville's approach of offering fresh, locally sourced and sustainably farmed ingredients to the next level, by adding two gourmet, seasonal food combination's to its menu each month that will feature a locally produced ingredient at the peak of its freshness. While others in the food service industry are focusing on value menus, Burgerville is focusing on delivering high quality, gourmet dining options, at value prices. The prices of these new gourmet menu offerings fall directly in line with already established menu favorites. Serving local beer and wine is the latest innovative step Burgerville is taking to enhance guest experience. Beers and wines from a select group of local wineries and breweries have been carefully chosen by an internationally renowned sommelier, Christine Tran, to complement new menu items such as the Grilled Asparagus and Tomato Melt, Grilled Asparagus Spears and the Spring Spinach and Chicken Salad. The local wine offerings include the Ponzi Tavola Pinot Noir, O'Reilly Pinot Gris and the Eyrie Vineyards Chardonnay. Burgerville also capitalized on the area’s abundant breweries like the Widmer Brothers Brewery and the Full Sail Brewing Co. and sought the best complement to seasonal and regular menu items such as the Wild Smoked Salmon Salad and the Spicy Anasazi Bean Burger. 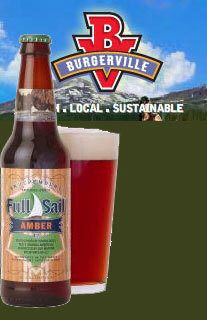 The selected beers include Widmer Hefeweizen, Full Sail Amber (pictured) and Terminal Gravity ESG.